The Exploded Views Lab investigates the methods applied by Marnix de Nijs to create his interactive video artwork, Exploded Views. The Exploded Views Lab investigates the methods applied by Marnix de Nijs to create his interactive video artwork, Exploded Views. Participants will source images, sound bites and video clips from online networks to create their own 3D data visualisation of Sydney. Through the game engine Unity, these digital files will be developed into personal 3D data visualisations of Sydney. Unity is one of the leading platforms for 3D video game creation that enables users to intuitively develop multiplatform games. 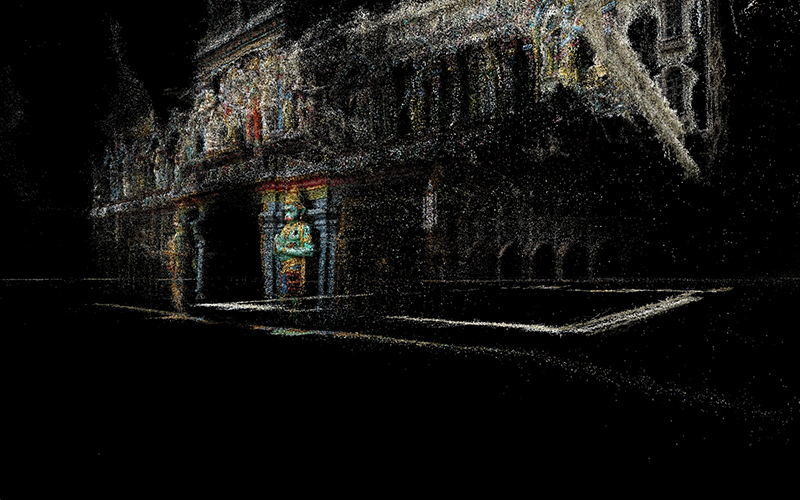 Programmers will assist participants in developing and rendering their Sydney 3D cityscapes. The function of the workshop is to generate your own artworks. Artworks completed in the lab will be considered for the next Running the City exhibition. Marnix de Nijs is a Dutch installation artist. He has been a pioneer in researching the experimental use of media and technologies in art, critically examining their impact on contemporary society and human perception. De Nijs’ recent interactive installations use imagery, sound and movement to reflect on technology’s ability to influence communication and cultural change. Often incorporating recorded data and responsive imagery, his large-scale video projections are completely immersive, which is reflective of his background in sculpture. Limited numbers, registration essential via Eventbrite. You will be asked to provide your staff/student number at registration.